Once you’ve tried these, you’ll never go back to shop-bought versions. They need a little skill in the rolling, but are otherwise really easy to make. Step 1 – Make the sponge. Sift the cocoa powder into a small bowl, add the butter, vanilla and boiling water and combine. Set aside. Step 2 – Put 100g of the caster sugar and the egg yolks in a bowl and whisk together until light, thick and fluffy. Add the chocolate mixture and whisk until combined. Step 3 – In a separate bowl, whisk the egg whites to stiff peaks. Add the remaining 50g of caster sugar and whisk until the sugar has dissolved. Step 4 – Beat one third of the meringue mixture into the chocolate mixture to loosen. Using a large metal spoon, fold the remaining egg whites through the mixture until fully combined. Step 5 – Divide the mixture between the 2 lined tins and level out. Bake for 12–18 minutes, until cooked through and springy. Step 6 – Place the tins on a wire cooling rack, cover with a damp tea towel and leave to cool completely. Step 7 – Make the filling. Beat the butter in a bowl with a wooden spoon, until soft, and gradually beat in the icing sugar. Add the peppermint essence and continue beating until white, soft and fluffy. Step 8 – Turn out the cooled cakes onto the 2 sheets of baking paper. Peel off the top layer of baking paper. Turn the cakes so that the short end is facing you. Score a line 4cm in from the short end of each cake. Spread the peppermint cream over the top and towards the edges. Step 9 – Take 1 sponge and, starting from the short edge closest to you, roll up the cake, stopping in the middle. Repeat from the edge farthest away, until both rolls meet in the middle. Cut down the centre between the rolls. Step 10 – Repeat with the remaining sponge, so you have 4 rolls. Trim the ends and cut each roll into three so you end up with 12 mini rolls. Step 11 – Place the rolls, seam-sides down on a cooling rack and chill for 15 minutes to firm up. Step 12 – To finish, melt the plain and milk chocolate together in a bowl suspended over a pan of barely simmering water. 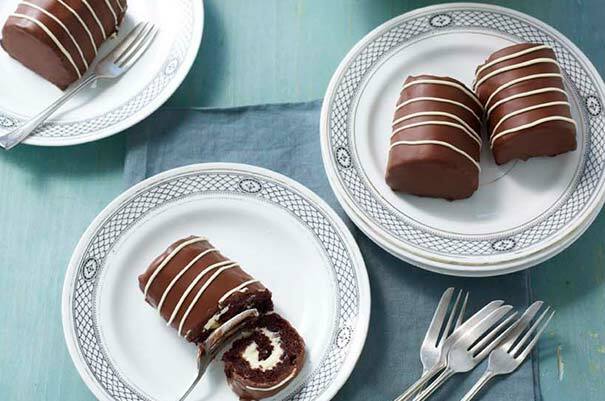 Place the cooling rack over a baking tin (to catch the chocolate) and dip, spread or pour the chocolate over each mini roll to coat. Leave to set. Step 13 – Melt the white chocolate in a bowl suspended over a pan of barely simmering water. Spoon into the small disposable piping bag and snip the end. Pipe fine stripes across the mini rolls, then leave to set.